Medical There are 18 products. White curved women's tunic with rounded collar, raspberry pink trim, side slits and hidden press studs. Tunic with short sleeves. Pleats in the back pink raspberry for comfort. Chest pocket and low pockets with rounded pocket. 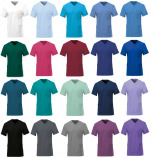 Tunic 65% polyester and 35% cotton, 215 gr/m². Length S = 75 cm. Mixed/man tunic 65% polyester 35% cotton, 145 gr/m². Practical tunic with v-neckline, short sleeves, 2 side pockets, 1 breast pocket and side vents for comfort. Lady tunic 65% polyester 35% cotton, 145 gr/m². 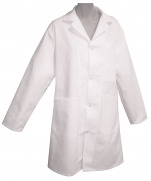 Practical tunic with v-neckline, short sleeves, 2 side pockets and side vents for comfort. 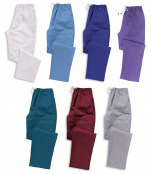 Mixed trousers (man/woman) 65% polyester 35% cotton, 145 gr/m². Practical pants elasticated at the waist and 1 back pocket. Inside leg : 74, 79 or 96 cm ((length to specify us when ordering, see grid size). Trousers matching tunics. Mixed trousers (man / woman) 65% polyester 35% cotton, 195 gr/m². Practical pants elasticated at the waist with drawstring and 2 side pockets. Inside leg : 79, 84, 91 or 96 cm (length to specify us when ordering, see grid size). Trousers matching tunics. Mixed tunic 65% polyester 35% cotton, 195 gr/m². Practical tunic with v-neckline, short sleeves, 2 side pockets, 1 breast pocket and side vents for comfort. Bib waterproof adult, 45x90 cm, 140gr/m². Topside of the bib : 50% cotton and 50% polyester. Backside of the bib: 100% polyester waterproof PVC. Bib with rounded edge. Drawings: green tiles. Regable by pressure. Finishing white border/bias all around. Washable at 95°C and allowed dryer. Bib waterproof adult, 45x90 cm, 140gr/m². Topside of the bib : 50% cotton and 50% polyester. Backside of the bib: 100% polyester waterproof PVC. Bib with rounded edge. Drawings: blue tiles. Regable by pressure. Finishing white border/bias all around. Washable at 95°C and allowed dryer. White moccasin shoe stem microfiber security S2 standard EN345 2011. Non-metallic toe and composite shell (200J). Removable insole. Waterproof outsole, slip resistant, antistatic, resistant to oils, hydrocarbons and solvents. Ergonomic design of the sole heel for better energy absorption (30J). Special joint shoe for the food industry. Black moccasin shoe stem microfiber security S2 standard EN345 2011. Non-metallic toe and composite shell (200J). Removable insole. Waterproof outsole, slip resistant, antistatic, resistant to oils, hydrocarbons and solvents. Ergonomic design of the sole heel for better energy absorption (30J). Special joint shoe for the food industry. Asymmetric lady's tunic with zipper and 3 concealed snaps, 100% polyester easycare. Tunic with mandarin collar, 2 concealed side pockets, pleats at the back, side slits. Color tunic with color siding. Touched sweet. Washable up to 40°C. Exists from size XS to 2XL. Back length from 72 to 78 cm (increases depending on size).